Water pollutants refer to the substances which are capable of making any physical, chemical or biological change in the water body. These have undesirable effect on living organisms. Water is called polluted when the water is contaminated with domestic waste and industrial effluents. When this contamination reaches beyond certain allowed concentrations then the water pollution occurs. Water is considered polluted if some substances or condition is present in the water changes it’s physical, chemical, or biological characteristics to such an extent that the water cannot be used for its intended use or for a specific purpose. Pollution affects the quality of water is an adverse way due to the addition of large amounts of unwanted materials to the water. Water pollution occurs due to the presence of excessive amounts of a hazard (pollutants) in water in such a way that it is no long suitable for its intended use. Water pollution has a duel effect on nature. It has harmful effects on the living beings and also on the environment. Water pollution has many sources and characteristics. Pollution to the water environment can come from a wide range of sources. These include agriculture (crops and livestock), atmosphere (acid rain), aquaculture, forestry, illegal dumping of waste, industry, mines, sewage, and urban areas and roads etc. When the polluted water seeps into the ground and enters an aquifer it results into ground water pollution. The pollution of ground water is a matter of serious concern. Ground water gets polluted in a number of ways. The porous layers of soil hold back solid particles while the liquid is allowed to pass through. The soluble pollutants are able to mix with the groundwater. In addition to these, the excessive use of nitrogenous fertilizers and unchecked release of toxic wastes and even carcinogenic substances by industrial units can result in slow trickling down through the earth’s surface and mixing with the groundwater. This problem is very serious especially in areas where water table is high. Further, since the movement of groundwater through the porous rock is very slow, pollutants which get mixed with the groundwater are not readily diluted. Furthermore, groundwater does not have access to air (in contrast to surface water) therefore, oxidation of pollutants into harmless products in groundwater does not occur. Water pollution can occur from two sources (Fig 1) namely (i) point source, and (ii) non-point source. The well-defined sources which emit pollutants or effluents directly into different water bodies of fresh water are called point sources. Point sources of pollution are those which have direct identifiable source. Example includes discharge from a pipe attached to a production unit, oil spill from a tanker, and effluents coming out from industry etc. Point source of pollution includes waste water effluent (both municipal and industrial) and storm sewer discharge and affects mostly the area near it. The point sources of pollution can be effectively checked. Point sources of pollution are normally monitored and regulated. The non-point sources of water pollution are those which arrive from different sources of origin and are usually scattered or spread over large areas. These types of sources deliver pollutants indirectly through environmental changes and account for majority of the contaminants in streams and lakes. For example, the contaminated water which runs off from agriculture farms, construction sites, abandoned mines, and acid rains enters streams and lakes. It is quite difficult to control non-point sources. One of the major sources of water pollution is the industrial processes. Such water can also be too hot or too low in dissolved oxygen to support life. The characteristics of industrial waste waters can differ considerably both within and among industries. The impact of industrial discharges depends not only on their collective characteristics, such as biochemical oxygen demand (BOD) and the amount of suspended solids, but also on their content of specific inorganic and organic substances. Three options are available in controlling industrial wastewater. These are (i) control can take place at the point of generation in the plant, (ii) wastewater can be pretreated before discharge to municipal treatment sources, or (iii) wastewater can be treated completely at the plant and either recycled (reused) or discharged directly into receiving waters. Water is considered to be polluted when the three parameters of water namely (i) physical parameters, (ii) chemical parameters , and (iii) biological parameters deviates beyond a specified concentration. Physical parameters are colour, odour, turbidity, taste, temperature, and electrical conductivity etc. Chemical parameters include the quantity of carbonates, sulphates, chlorides, fluorides, nitrates, and metal ions etc. in water. These chemicals form the total dissolved solids present in water. Biological parameters include matter like algae, fungi, viruses, protozoa and bacteria. Substances or conditions which are contaminating the water are called contaminants or pollutants. 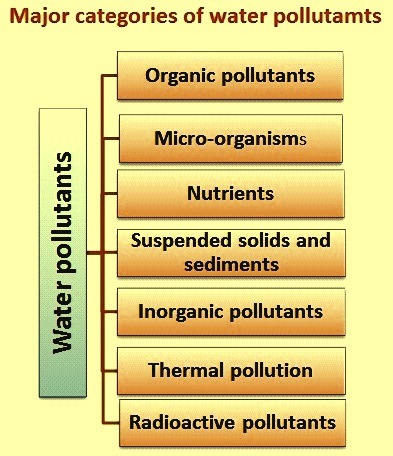 There are different types of water pollutants (Fig 2). The major categories of water pollutants are (i) organic pollutants, (ii) micro-organisms (pathogens), (iii) nutrients, (iv) suspended solids and sediments (organic and inorganic), (v) inorganic pollutants (chemicals, salts and metals), (vi) thermal pollution, and (vii) radioactive pollutants. Organic pollutants include; proteins, carbohydrates, fats and oils, dyestuffs, organic acids, phenols, detergents and organo-pesticides. Organic pollutants are organic compounds which are resistant to environmental degradation through chemical, biological, and photolytic processes. Because of this property of the organic pollutants, these pollutants have potential adverse impacts on the human health and the environment. Organic pollutants can be further divided into three categories namely (i) oxygen demanding wastes, (ii) synthetic organic compounds, and (iii) oils and grease. Oxygen demanding wastes – The waste waters such as, domestic and municipal sewage and waste water from certain industries have considerable concentration of bio-degradable organic compounds either in suspended, colloidal or dissolved form. These wastes undergo degradation and decomposition by bacterial activity. The dissolved oxygen available in the water body gets consumed for aerobic oxidation of organic matter present in the waste water. Hence, depletion of the dissolved oxygen takes place. This adversely affects the aquatic life if the dissolved oxygen falls below critical level. The decrease of dissolved oxygen is an index of pollution. Synthetic organic compounds – Synthetic organic compounds pollute water when they enter the water through various manmade activities such as production of these compounds, spillage during transportation, and their uses in different applications. These include synthetic pesticides, synthetic detergents, food additives, pharmaceuticals, insecticides, paints, synthetic fibers, plastics, solvents and volatile organic compounds (VOCs). Most of these compounds are toxic and bio-refractory organics i.e., they are resistant to microbial degradation. Even concentration of some of these in traces can make water unfit for different uses. The detergents can form foams and volatile substances can cause explosion in sewers. Polychlorinated biphenyls (PCBs) are used in the industries since 1930s which are complex mixtures of chloro-biphenyls. Being a fat soluble they move readily through the environment and within the tissues or cells. Once these compounds enter water, these compounds are exceedingly persistent and their stability to chemical reagents is also high. Oils and greases – Oils and greases are complex mixtures of hydrocarbons and degradable under bacterial action. The bio-degradation rate is different for different oils and greases with the bio-degradation rate for the tars being one of the slowest. Oil enters in to water through oil spills, leak from oil pipes, and waste water from the by-product plant of the coal carbonization plant. Being lighter than water, oils and greases spread over the surface of water, separating the contact of water with air, hence resulting in reduction of the dissolved oxygen. A surface film of oil on water restricts reoxygenation and together with bacterial degradation of the oil hydrocarbons causes the dissolved oxygen content to fall quickly. Oils and greases are also responsible for endangering water birds and coastal plants due to coating of oily materials and adversely affecting their normal activities. It also results in reduction of light transmission through surface waters, thereby reducing the photosynthetic activity of the aquatic plants. Oils include polycyclic aromatic hydrocarbons (PAH), some of which are known to be carcinogenic. The pathogenic micro-organisms enter in to water body through sewage discharge as a major source or through the waste water from industries. Organic matter is described as bio-degradable if it is readily decomposed by the action of micro-organisms. The micro-organisms exist as a mixture of bacteria, fungi and Protozoa. In heavily polluted water, they are visible as pink, yellow, brown slimy growths which are often called ‘sewage funguses. The micro-organisms utilize pollutive organic compounds for their growth and nutrition and produce simple products, thereby reducing the amount of pollution. There are two types of metabolism, aerobic and anaerobic. Aerobic micro-organisms use oxygen to carry out oxidation reactions such as the (i) carbohydrates, phenols etc. are converted to carbon dioxide and water, (ii) organic nitrogen compounds are converted to carbon dioxide, water, amines and ammonia, (iii) organic sulphur compounds are converted to sulphides, and (iv) organic phosphorus compounds are converted to phosphates. Biodegradation of these compounds rapidly decreases the dissolved oxygen, and creates a BOD in the polluted water. Heavily polluted water has little or no dissolved oxygen. Under these conditions only anaerobicmicro-organisms can exist. Under anaerobic conditions, the anaerobic micro-organisms cause these reactions to occur namely (i) carbohydrates are converted into methane, (ii) organic sulphur compounds and sulphates are converted into sulphides, (iii) organic phosphorus compounds are converted to phosphine, (iv) organic nitrogen compounds are converted to nitrate, and then ammonia. Ponds, streams and rivers which are heavily polluted often have an obnoxious smell caused by hydrogen sulphide, and may show a black deposit of Iron (II) sulphide and heavy growth of ‘sewage fungus’. The type of bio-degradation which occurs is also affected by the content of pollutive discharges. If the effluent contains biological toxins such as heavy metals, cyanides and sulphides the aerobic micro-organisms will be killed, even if there is sufficient dissolved oxygen in the water. The waste water from ammonium sulphate plant producing ammonium sulphate fertilizer as well as sewage contains substantial concentration of nutrients like nitrogen and phosphorous. These waters supply nutrients to the plants and can stimulate the growth of algae and other aquatic weeds in receiving waters. Thus, the value of the water body is degraded. After lapse of substantial time, dissolved oxygen of the water body reduces, leading to eutrophication and ends up as a dead pool of water. Any person swimming in eutrophic waters containing blue-green algae can have skin and eye irritation, gastroenteritis and vomiting. Eutrophication is the process through which a body of water becomes enriched with chemicals such as nitrates and phosphates. Algae and other aquatic plants then feed on these nutrients leading to excess growth. This leads to a reduction in the amount of dissolved oxygen available as algae blooms on the surface restrict the amount of sunlight penetrating the water limiting photosynthesis which causes the death and decomposition of plant life underwater. The lack of dissolved oxygen also kills all animal life in the water body. High nitrogen levels in the water supply, causes a potential risk. This is when the methaemoglobin results in a decrease in the oxygen carrying capacity of the blood as nitrate ions in the blood readily oxidize ferrous ions in the haemoglobin. The main effects caused by eutrophication process can be summarized as (i) species diversity decreases and the dominant biota changes, (ii) plant and animal biomass increase, (iii) turbidity increases, (iv) rate of sedimentation increases, shortening the lifespan of the lake, and (v) anoxic (deficiency of oxygen) conditions can develop. Suspended solids and sediments are pollutants (substances, particles and chemicals) which do not easily dissolve in water. These materials are called particulate matter. These are solids in water which can be trapped by a filter. These solids can include a wide variety of materials. These comprise of silt, sand, minerals, ash, and flue dust recovered from various gas cleaning units in the plants. These appear in the water as fine suspended solids. High concentrations of suspended solids can cause many problems. Some suspended pollutants later settle under the water body. This can lead to the siltation, reduces storage capacities of reservoirs. Presence of suspended solids can block the sunlight penetration in the water, which is required for the photosynthesis by bottom vegetation. This can harm and even kill aquatic organisms which live at the bottom of water bodies. Deposition of the solids in the calm stretches of the stream can impair the normal aquatic life and affect the diversity of the aquatic ecosystem. If the deposited solids are organic in nature, they will undergo decomposition leading to development of anaerobic conditions. Finer suspended solids can injure the gills of fishes and cause asphyxiation. Apart from the organic matter discharged in the water body through sewage and industrial wastes, high concentration of heavy metals and other inorganic pollutants contaminate the water. Inorganic pollutants include mineral acids, alkalis, metals, metallic salts, complexes of metals with organic compounds, trace elements, phosphates, nitrates, other salts, bleaches, sulphides, sulphates, cyanides, cyanates, chromates, and minerals etc. Inorganic pollutants are non-biodegradable. The accumulation of inorganic pollutants can have adverse effect on aquatic flora and fauna and can constitute a public health problem where contaminated organisms are used for food. Thermal pollution can occur when water is used as a coolant near a power or industrial plant and then is returned to the aquatic environment at a higher temperature than it was originally. As a result of hot water discharge, the temperature of water body increases. Thermal pollution can lead to a decrease in the dissolved oxygen level in the water while also increasing the biological demand of aquatic organisms for oxygen. This affects adversely the aquatic life. This alters the spectrum of organisms, which can adopt to live at that temperature and dissolved oxygen level. When organic matter is also present, the bacterial action increases due to rise in temperature; hence, resulting in rapid decrease of dissolved oxygen. The discharge of hot water leads to the thermal stratification in the water body, where hot water will remain on the top. Radioactive materials originate from the (i) mining and processing of ores,(ii) use of isotopes in research and industrial activities, and (iii) radioactive discharge from nuclear power plants and nuclear reactors. These isotopes are toxic to the life forms since they accumulate in the bones, teeth and can cause serious disorders.